It's Pub Night: Happy 100th, Shiner! This year marks the 25th anniversary of two fine Oregon breweries: Bridgeport and Widmer. It also happens to mark the 100th anniversary of a brewery near and dear to my heart: the Spoetzel Brewery in Shiner, Texas. In the 80's, when I was a college student in Austin, there were two flavors of Shiner beer available: Shiner Premium and Shiner Bock. There may not have been much difference between the two: one time we were in the hospitality room after a tour of the brewery, and a longtime employee told us that the only difference was some caramel coloring added to the Bock. It didn't matter to us: Shiner Bock was better than the fizzy yellow beer you could get during those pre-microbrew times, and miraculously, it was usually cheaper. Things have changed a lot since then. After Gambrinus -- also Bridgeport's owner -- bought the brewery, they applied some marketing savvy to the brand. For one thing, they attracted a larger customer base by raising the price of Shiner. Shiner Premium was renamed Shiner Blonde, and some new variations started coming out: first a Hefeweizen, then Shiner Light, and a Dunkelweizen at some point. They grew the distribution -- it's surprising to think of now, but pre-Gambrinus Shiner wasn't sold in many grocery or convenience stores in Texas -- to the point where in 2008 Spoetzel Brewery was the 10th-largest in the US by sales. Shiner's push into Oregon a few years ago fizzled out, but it is still distributed in Washington. In the years leading up to this year's 100th anniversary, Shiner came out with a special edition brew each year, culminating appropriately this year with a doppelbock called Commemorator. The special editions -- numbered 95 - 100 -- have been nicely done, obviously a labor of love by the brewers. I smuggled some of the doppelbock back with me on The Last Trip To Tulsa. It's got that maple sweetness that made me fall in love with Paulaner Salvator years ago -- candy beer. A thinner body than the best doppelbocks, and with a correspondingly weaker finish, but a good solid effort. I also liked the mesquite-smoked rauchbier -- called Smokehaus -- that Shiner came out with this year. Maybe it's based on the 99 commemorative Helles? Decent body to it, and the smoke flavor is obvious but not distracting. It's been quite a Shinery summer at my house: Po also brought me a mixed six-pack called the Shiner Family Reunion, that included a bottle of the lovely 97 schwarzbier and a good old Shiner Bock. So, happy birthday, Shiner! You opened my eyes to beer. It's wonderful to see that you can grow a nationwide product from a small town, and also brew up some nice surprises like Commemorator and Smokehaus. For further reading, check out my buddy Lee's interview with the author of Shine On , a coffee-table book commemorating the brewery's 100th anniversary. 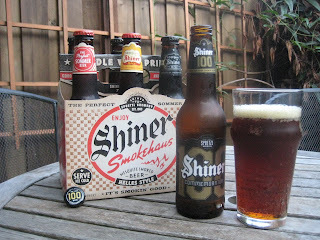 If you didn't catch it, I did an article earlier this year about Shiner's 100th. It has some great historic photographs. Thanks, Lee, that was a great interview! I linked to it in the post now. B and I have fond memories of Shiner pre-gambrinus! They used to have Shiner night at a bar in Jackson - $1 draft and a really good band named The Shines would play.